Cupcake Packet Sample - Freebie! -"Party Time" worksheet to teach or review question words (who, what, where, why, how, when) and to allow students to plan their dream party by answering all of those questions! 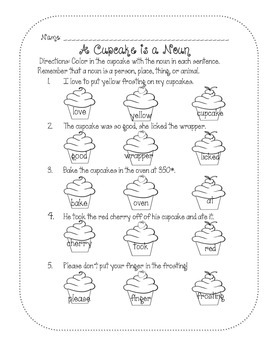 In this sample, you can get the "Cupcake is a Noun" worksheet for free! Enjoy! And be sure to check out the rest of the packet if you like it.